On August 5 when I came downstairs I discovered that the screen covering my skylight had fallen into the sunporch, and there was mud and suspicious looking footprints all over the floor, along with what appeared to be animal urine (I had just shampooed the rug, too). The scenario was pretty clear. Some animal had tried to crawl onto the screen, and fallen through. Based on the murky footprints I suspected a raccoon. But where was it? I searched the porch, but it was obviously not there, and I tried to look for more footprints in the house but could find none. Meanwhile, the cats could care less. Addie was curled up on the guest bed, and Diego was eating breakfast. Stymied, I sat down in the den to figure out what to do. There was a crash in the living room (the cats grooming themselves) so I went in and found a painting had fallen off the wall over the desk. 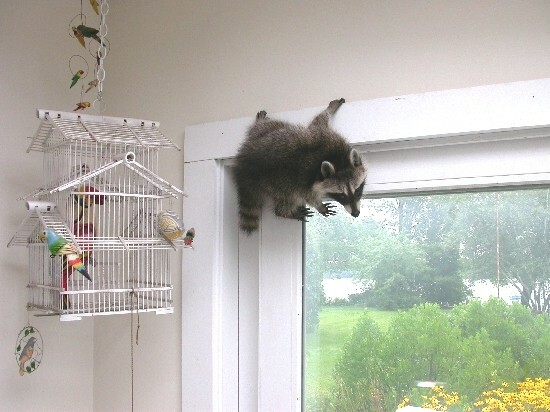 Raccoon? Surely not. I replaced it. Ten minutes later the same crash, and the painting was down again (cats watching TV), but this time I saw the culprit on top of the desk. Grabbing a large cardboard box I guided it into a corner where I slid the box around the raccoon. Propping it solidly in place I grabbed a beach towel from the sunporch and threw it over the box and gently tried to turn it up. 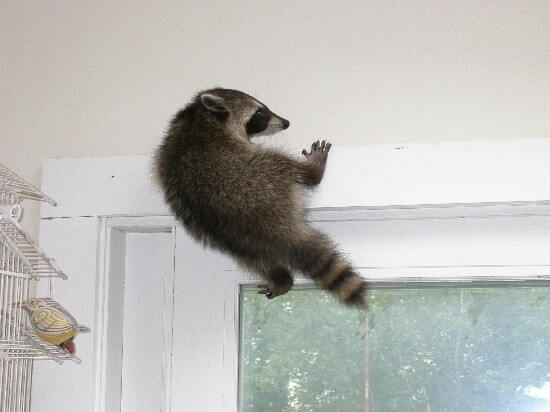 The raccoon grabbed the towel and leapt out of the box, scuttered through the house, and ended up on the sunporch on top of the door frame. I shut the door from the house to the porch, grabbed my camera and took a couple of shots, then opened the screen door to the outside. The raccoon crawled along the top of the door, slid himself outside and dropped to the ground and disappeared under the porch. 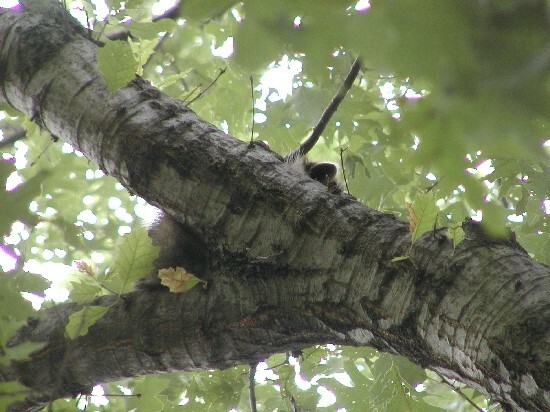 An hour or so later, I heard some crows fussing in the yard, and searched the oak for the reason for the fuss. I caught a glimpse of my nocturnal visitor taking a nap.